The site of maritime activity of the Harappan Civilisation, Porbandar has always been a famous port for trade activities since the ancient era. Its commercial exploitation during the past centuries has left a rich historical impact. The city is also the birthplace of Mahatma Gandhi. Porbandar was known as Pao Bandar meaning "bread port" for its export of bread to Arabic nations during the early modern phase. It later went on to become the seat of the Mughal kingdom after they overran the Gujrat kingdom, and later on it was taken over by the Marathas. Summers are hot and sultry and should be avoided. Porbandar faces strong monsoonal winds and moderate rainfall. Nearby areas bloom with greenery during the rains which gives a spectacular view of the region. Winters are cool and pleasant in Porbandar and July to February is the best time to visit. The afternoon sun is quite warming to visitors during winters and gives a spectacular sight, illuminating the sites in hues of gold. Porbandar is roughly 400 km from Ahmedabad depending on the route taken. There are two primary routes that can be accessed while travelling to Porbandar. The travel time is roughly around 8-9 hours. Route 1 is 394 km while route 2 is about 408 km. Route 2 is the preferred route as it passes through some of the most spectacular places of Gujarat and prevents a monotonous journey. The travel is through a network of cities and towns so there is no need to worry about fuel and food. Surendranagar lies at a distance of 128 km from Ahmedabad. The city is a commercial hub but holds a deep religious significance and is also a perfect destination for a break. The Chamunda Mata Temple, located on the Chotila hills, is an ancient temple; it takes 30 minutes to climb up. The entire view from the hill is spectacular. Further ahead, the Trineteshwar Temple is located which is an ancient temple dedicated to Lord Shiva. The temple premise is spacious and is a perfect place to get some rest. Before leaving, one might also visit the Dholidhaja Dam on the Bhogavo river. The dam is surrounded by a massive stretch of trees which were built as a part of a conservation drive. 108 km ahead of Surendranagar lies Rajkot. The place is good for foodies as there are many local restaurants located near the highway. Rajkot is known for its one of a kind doll museum, the Rotary Doll Museum. The museum houses hundreds of dolls from over 102 countries. The dolls are well-preserved and authentic information is also provided along with the displays. Kids will definitely love the place. Kaba Gandhi No Delo is the place where Gandhiji spent a part of his childhood. This place is located between a busy yet old lane of Rajkot. The place brings historic nostalgia and is associated with the freedom struggle. Inside the gates of the place, displays of Gandhiji's articles and photographs can be seen. A history lover must visit the place. If one has interest in knowing the culture and history of Gujarat, the Watson Museum should be on the list. It contains historical accounts and artefacts of important places and battles and rocks of Gujarat. To reach Porbandar from Rajkot, you'll have to pass through Dhoraji, which is 89 km from Rajkot; Porbandar is 95 km from Dhoraji. The coastal city of Porbandar has evolved from being a commercial hub to a city that displays rich heritage and spirituality. There are numerous destinations that might be explored in the beautiful city. Kirti Mandir is perhaps the most important building of Porbandar. It houses the memories of Mahatma Gandhi and Kasturba Gandhi. It is built adjacent to the ancestral house of Mahatma Gandhi. Constructed in 1950, the house displays a vivid portrayal of the famous personality and his association with his native state. It also showcases the life of Mahatma Gandhi through his articles, photographs and many artefacts that are still preserved till date telling the story of freedom struggle and immense sacrifice. It is a prominent Hindu temple dedicated to the friend of Lord Krishna. The ambience of the temple is serene and the architecture is magnificent. Also known as the India Temple, Bharat Mandir showcases the tradition and geography of India through its sculptures, maps, pictures and many other objects. Hindu tradition is also vividly portrayed within the premises. The temple also houses brass reliefs and stone carvings of mythological heroes. The sanctuary is located within the heart of the city and is one of its kinds where the local people live in harmony with nature. 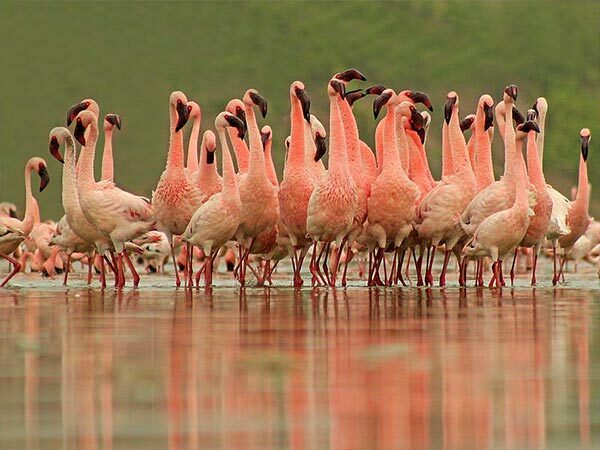 The birds are provided legal protection and one might also encounter exotic migratory birds during various seasons that halt for mating in the nearby lakes.